Blockchain complexes will be created in Gaepo and Mapo, Seoul, to accommodate 200 companies. The complex in Gaepo, which will be built in the Digital Innovation Park by 2021, will become the largest blockchain center in Korea. The Seoul Metropolitan Government will also spend 123.3 billion won over the next five years to activate blockchain and create a 100 billion won “blockchain Seoul fund” in cooperation with the private sector. 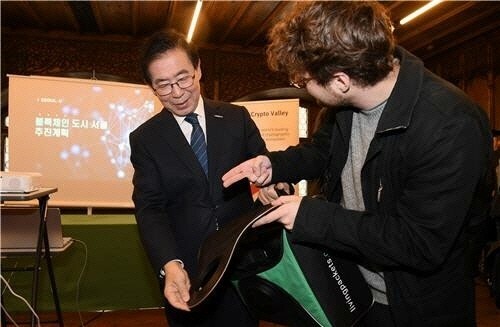 Seoul Mayor Park Won-soon, who is now visiting Europe, unveiled his blockchain master plan during a press meeting in Zug, Switzerland, Thursday. The five-year plan is intended to help revitalize blockchain, one of the Fourth Industrial Revolution’s core industries. “Blockchain technology can be applicable in several areas but people’s interest is solely on cryptocurrency. I will do my best to create Seoul as the center of the blockchain ecosystem as there is no doubt that blockchain technology will hold the key to the future IT industry,” Park said. The key in Mayor Park’s blockchain plan is to build an industrial ecosystem. Its major programs include creating complexes; supporting corporate growth; nurturing professionals; backing MICE (meetings, incentives, conferencing and exhibitions) industries; and strengthening private-public cooperation. The blockchain complexes will be built in the Gaepo Digital Innovation Park and the Seoul Startup Hub in Mapo. To begin with, there will be spaces for 50 startups and midsized firms for the Gaepo park and 23 for the Mapo hub until next year. The 100 billion won blockchain Seoul fund will be created by 2022 to be invested in promising startups. The Seoul Metropolitan Government will pump the prime by shouldering 14 percent of the total or 13.6 billion won while the rest will come from the private sector. The municipal government will also push ahead with the “Seoul-type official development assistance (ODA) project” to support projects that could be exported to foreign cities readily. To attract people from around the world interested in blockchain to Seoul, it will give a big boost to the MICE industries. Seoul City will provide up to 100 million won to the most competitive blockchain event and create blockchain tours so that MICE participants can visit blockchain hotspots in the capital city. Mayor Park also unveiled a plan to make Seoul a “test bed” for blockchain where blockchain companies can apply and verify their technologies. “No other cities have fully tried to apply blockchain technology to the real administration. Seoul’s attempt will serve as an important occasion to activate the blockchain industry,” he said. As administrative services that can be applied first, he cited online voting, management of secondhand cars and donations, automatic payment of subcontract fees and issuance of various certificates. The Seoul Metropolitan Government will join forces with Seoul Economic Daily, Chain Partners, WeWork, Japan’s CTIA and VCG to organize the inaugural Asia Blockchain & Fintech (ABF) in Seoul at the Seoul Startup Hub, Shilla Hotel, Sebitseom and WeWork Oct. 27-Nov. 1. This is the first blockchain event to be hosted by Seoul City. [ABF in Seoul] Seoul to take lead in boosting blockchain was originally published in Data Driven Investor on Medium, where people are continuing the conversation by highlighting and responding to this story.